Government of Andhra Pradesh and the State Council of Educational Research and Training (APSCERT) has provide the elementary education syllabus for all AP State Primary Schools to class 1st, 2nd, 3rd, 4th and 5th standard Telugu Medium, English Medium and Urdu Medium Schools and the Department of School Education has conducted elementary education regular examination tests in both types of Formative Assessment (FA) and Summative assessment (or summative evaluation) (SA) for all primary school students of I, II, III, IV and V grade students to all government and private schools in the state. The Government of Andhra Pradesh and Council of Educational Research and Training has provide the elementary education syllabus for all class 1st to 5th standard students for all subjects of Mother language (Telugu/Urdu), Mathematics, English, Environmental Study’s and Computer Education and the school teachers are provide subject knowledge about class room subjects, work books, arts, physical education and activities more to every student of the school. Department of School Education (DSE) has announced the Mandal Praja Parishad School’s and private schools exam pattern for all Telugu Medium, Urdu Medium and English Medium Students in the state, the DSC has conducted those exams in two paper styles of Formative Assessment (FA) and Summative assessment (or summative evaluation) (SA) and the FA exams are conducted for 50 marks based on student skills. The SA exams are conducted also for 50 marks based on subject wise AP 1st to 5th Syllabus 2019, those students who are studying AP MPPS Elementary schools can follow their exam pattern for Nursery, LKG, UKG, 1st, 2nd, 3rd, 4th and 5th Standard government and private schools. The AP State FA exams are designed with completely 1 mark questions, 2 mark questions, 4 marks and 1/2 (half Mark like bit question) for each subject exam and the subject wise exams contains reflex, Notebook test (CLASS WORK), project work and slip test for 50 marks as per the following paper style and the exam pattern is applicable to all government, private administration primary schools across in the state. According to the reports, In previous years the AP government is called the exams as Unit tests like Unit Test-1 is FA-1, Unit Test-2 is FA-2, Unit Test-3 is FA-3, Unit Test-4 is FA-4, now they have changes the examination system as Formative Assessment for upgrading of education system in the state. This Summative Assessment exams are conducted for 40 marks for all subjects, and the question paper has deigned with 1 mark questions, 2 mark questions, 4 marks and 1/2 (half Mark like bit question) mark theory and objective type choice questions, all the students can attempt all questions with correct answers to get high score and the exams are conducted with the time duration of 2:30 hours as per paper style. In previous years the Summative Assessment exams are called as Quarterly, Half yearly, Pre-final and annual final exams for both of government MPPS schools and private schools in the state as per SCERT norms, we are advised to every student can contact your school headmaster to get more idea about the exam paper style. 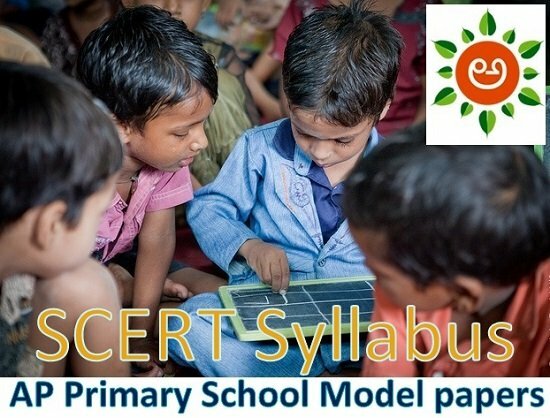 All primary school teacher’s can provide the elementary education model papers for every stage like Nursery, UKG, LKG and I to V class students at their school, and the SCERT has also provide the sample papers to every subject to the FA and SA exams, those students studying their elementary level education in the AP state schools they can download the APSCERT Sample papers 2019-20 with previous past years old examination question bank for guessing important questions with practicing the guessed papers. The AP State Educational websites and news portals of Sakshi, Eenadu and ABN Andhra Jyothy has provide the general Knowledge questions and SA, FA sample bits and study material to all grade students in the state, and they have not provided the downloadable study material for elementary level, students can follow the Sakshi, Eenadu, ABN news papers to get latest updates about GK questions and subject experts of the state provided study material for both medium students. We have provided some previous past years question bank to guessing important questions with practicing subject wise syllabus, students everyone can download the AP Primary School Model Papers 2019-20 with Subject experts suggested Sample papers and past 5 years and 10 years previous paper pdf question bank and practice them sincerely and conduct mock test your self regularly. if you have conducting regular mock test based on the guess papers and suggestions every student will get high sore of marks on first half exams, second half exams and annual final exams also. Government of Andhra Pradesh and Council of Educational Research and Training (APSCERT) has published and provide the state AP 1st to 5th Syllabus 2019 books for all Mandal Praja parishad Prarthmik Pathsala’s in the state and they have distribute every student at their schools, and the class teacher will suggest subject wise notes for all chapters to every class student, and the students who have studying at private schools they can buy their books at your school and we have provide SCERTAP English medium books download link to download all books online. The APSCERT has provide all class books in Pdf file format, download and take a photocopy and use if you have lost or forgotten your text books. Department of Education has started digitalization in the AP Board education system, and they have provide poems and rims through Audio and Video Visual class some schools and they have implement the scheme to all rural and urban area schools shortly, students everyone can watch all class room lessons and Nursery and KG level poems and rims through YouTube now available more syllabus lessons from the subject experts in the country.